Crowdfunding is marketing. And it’s the best kind – you get paid for it, rather than vice versa! “Marketing” can be a word that gives artists hives. But all it is is stepping way back from your project and looking at it through the eyes of your audience. What will entice them before they’ve had the chance to read your book / hear your album / see your film? Most marketing works on the paradox of “similar but unique”. You’ll want to be well-versed in what is familiar to your audience, and after that identify the element of your work that will uniquely grab their attention. The first step is knowing your audience as precisely as possible. This gives you a good profile of to whom you’re talking when you’re sharing your message. Many artists think they’ll sell more if they explain why really their book / album / film / project is for everybody – but it won’t. Get specific. This helps to set the right tone. Step Two is another one that artists often dislike: classify your work. You may think your project transcends genre – and maybe it does – but that will not help sell your work. Pick the genre that is the best fit. Which (online) shelf does your work match? This helps to set the right layout for your cover or preview. Pick 3-5 examples that stand out to you as great. What are the common components they share? Borrow these in your own marketing. This helps you to meet your audience’s expectations. Step Four is the fun part: identify the one unique element of your work that will be of special interest to your audience. Artists often want to select the sixteen elements of their work that are unique and amazing. And your audience will love them all -eventually. But you need to pick the strongest, most appealing one to sell your work first. A confused observer does not become a buyer. A strong unique element in a familiar layout will help you to surpass your audience’s expectations. 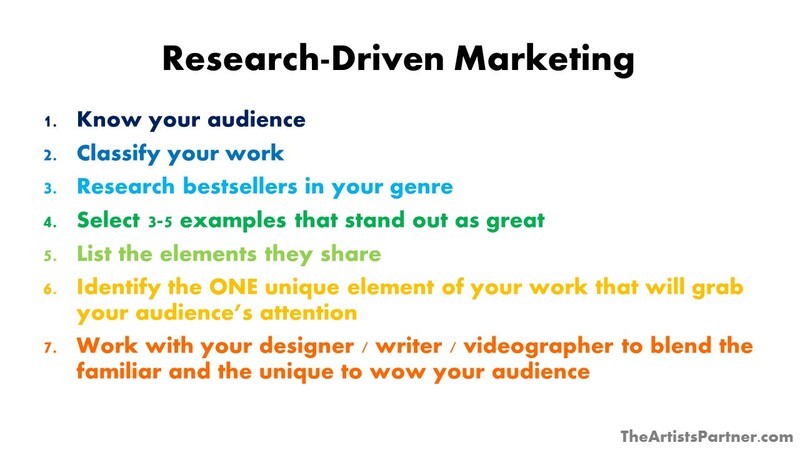 Step Five is to work with a designer, writer, videographer, or others to actually turn this research into the pitch for your project. With the above information and successful projects that have gone before you, you have what you need to be on the same page and craft a pitch your audience can’t resist. The first thing that people see when they visit your crowdfunding campaign is your pitch video. It’s important to make a good first impression! Clients of The Artist’s Partner have taken these suggestions and gone about creating their pitch videos in different ways. For many of our clients, it’s cost effective and pretty easy to shoot the pitch video with a smart phone and edit it with the free software that came with their computer or laptop (something like iMovie). This is an example of a video made in just that way, for a successful audiobook campaign from October 2014. A simple tripod with a smartphone holder, and a small microphone that plugs into the phone’s earphones outlet were used to stabilize the shots and improve the sound quality. This video has a DIY feel, but it is easy to see and hear what is going on. The book takes place on horseback in the mountains of Virginia, so it was shot with a horse in the beautiful Blue Ridge. For less than $100, this video helped propel the campaign to success! This video followed the recommended components (1-6 above) to a T.
For one of our musician clients, a great way to promote the album many months before their Kickstarter campaign even launched was to create a lyric music video. Slides were created on Powerpoint and edited in iMovie to sync the words with the images. Since this was using software already owned, the cost of producing this effective promotional video was free! This video showcased the music and functioned as a preview months before the campaign. You may see the final pitch video, which more closely followed components 1-6 above, here. Many of our clients enjoy having a professional video. This is a bigger commitment, taking several rounds to develop a script, choose a location, hire a crew, and do post-production. However, the results can be amazing, like this video for a children’s picture book. This video took a month of planning. This included working out the concept, writing the script, securing a location, selecting props, planning wardrobe, and picking music. Additionally, we needed a director, two crew members for the shoot, two cameras, microphone, lights, a rig for the moving shots, an animator, and an editor. To make a roughly 2-minute video, we needed 6 hours to shoot. With some creativity, we were able to make this video for $500. This means spending money before it was made on the video, but for this client, it was worth the expense to really make the campaign pop. This video focused on the product – the book – and incorporated the other components into the text of the campaign, which may be viewed here. Your campaign pitch is limited only by your imagination (and your budget, and video best practices!). Within these constraints, be sure to put your best foot forward with your crowdfunding pitch video. 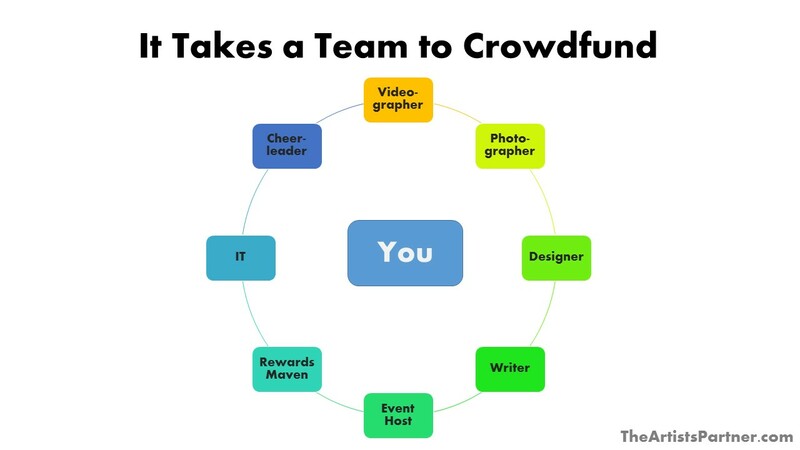 You’ll want to line up the following 8 people on your crowdfunding team to propel your campaign to success. One of the reasons clients of The Artist’s Partner succeed 97% of the time – compared to the industry average of 38% – is that they don’t do it alone. Videographer. Your 1-2 minute pitch video is your first impression – so make a good one! The video is so important, it has its own post (link to follow!). Photographer. You’ll need great pictures of your smiling face while you’re in action, doing what you do. This is particularly important for social media, and campaign updates. Selfies work, but not exclusively. Designer. Your campaign is going to need a balance of text and images – and it all needs to work together to create a cohesive brand. Colors, font, illustrations, pictures, and video all need to look like they belong together and communicate a cohesive message. Writer. Brevity is the soul of success – and it’s hard to write well and informatively without boring people. Your video script, project title, short blurb, reward descriptions, and “story” – the meat of your campaign – need to pop, entice people, and call them to action. Event host. Successful campaigns extend out of the ephemeral realm of the internet into the real world. You’re going to be way too busy to plan a concert or book reading – so an event host is essential. Rewards brainstormer. 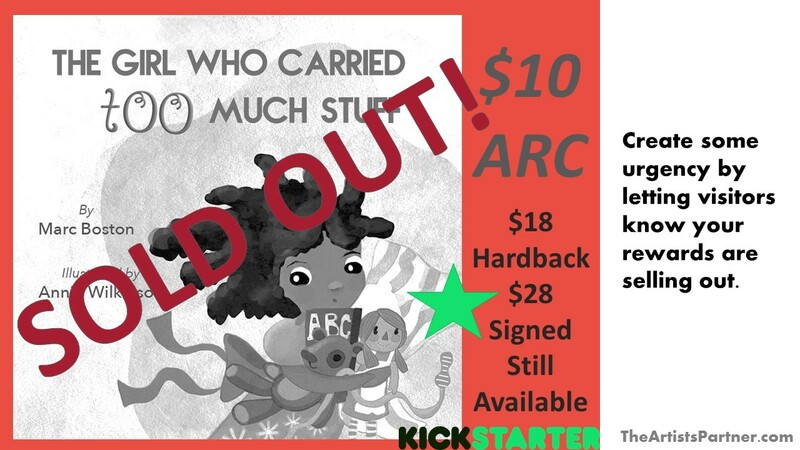 Beyond the $10-$20 copy of your book or album, or ticket to your show or film, what unique items can you offer at higher price points to entice your backers? The benefit of a group brainstorm session will lead to better answers to this important question. IT. Even though Kickstarter and Indiegogo have raised over $2Bn for creative projects, a LOT of people don’t know what they are or how to use them. 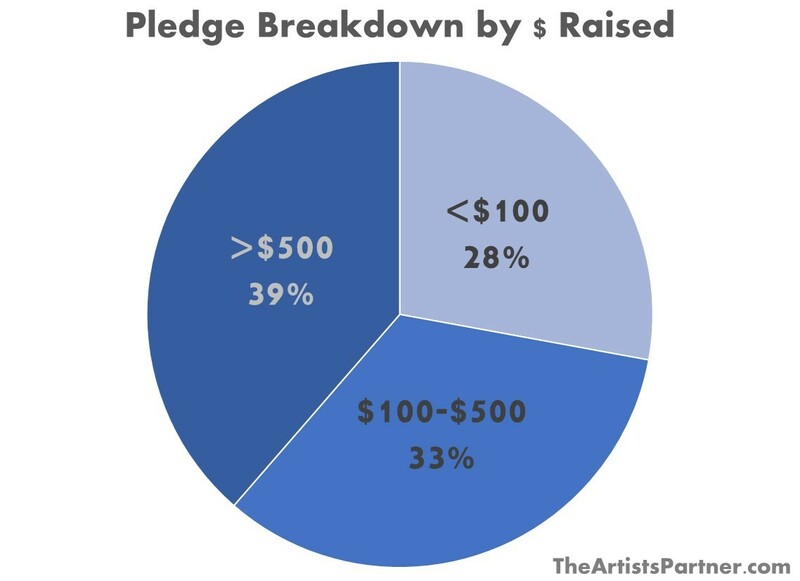 It’s a good idea to have a techie person lined up to help walk your less tech-savvy backers through how to pledge. Cheerleader. The month of the campaign feels looooong. For many, it’s exhausting. Who’s going to provide unconditional moral support to you when the going gets tough? Most of our clients can fill one or two of these roles themselves, and have skilled friends, family, and partners who can fill a few more. The videographer is the most frequent paid position, with a professional 1-2 minute video costing $200-$500. If you would like a free analysis of your crowdfunding plans, please fill out our Artist Questionnaire. We typically respond within two weeks. We look forward to hearing about your project! If you wait until launch day to start telling people about your crowdfunding campaign, it’s too late. 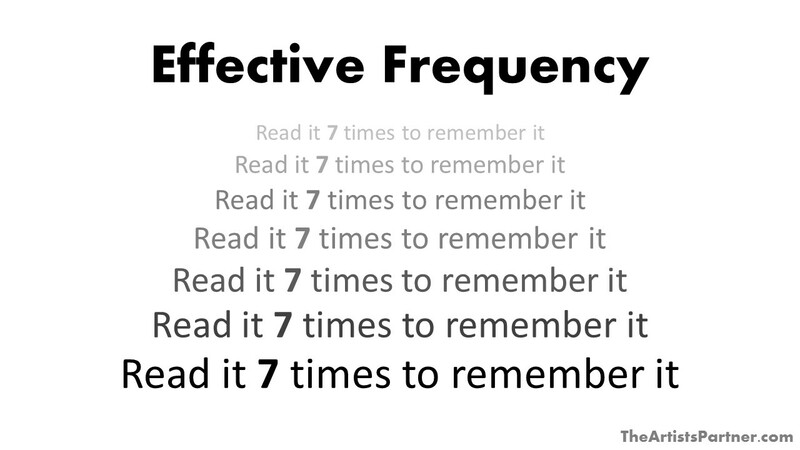 On average, a person needs to hear a message 7 times to act on it (what’s known in marketing as “effective frequency” or “the rule of 7”). That’s why advance communication makes or breaks a campaign – there’s not enough time to get your message in 7 times once it’s launched. Elevator pitch. You only have 135 characters – about a dozen words – to hook someone’s attention. You will use this pitch again and again – including as the headline of your crowdfunding campaign – so this is a bedrock of your project’s success. Writing a blurb is hard. Get help. Brainstorm. Write. Rewrite. Distill your project down to its irresistible essence. Day 1 Backers. We craft a 1-2-3 script for your Day 1 Backers: 1. Inform. 2. Engage. 3. Ask. Your Day 1 Backers are VIPs. They don’t get a mass email that starts “Dear Friend…”. They get invited to coffee, a Skype, or a phone call. In the first meeting, you share your key project visual and your elevator pitch. This is a good practice audience because they are already cheerleaders of you and your work. The next meeting, you request their feedback, advice, ideas, and input, and you consider it seriously. The third meeting, you ask them to be a Day 1 Backer. With an exchange of texts, messages, and emails in between, you’ve racked up your “7,” so your D1B’s are ready to roll come launch day. Influencers. We craft a 1-2-3 script for your Influencers, as well. Just like your D1B’s, these are VIPs who require individual communication. These folks have a large platform for communication – and almost certainly a schedule. You’ll want plenty of time to get them images, interviews, samples, descriptions, and whatever else they will need to support your project launch. Benefactors. And, we craft a 1-2-3 script for your Benefactors. These are the quintessential VIPs. They’re helping produce your project at the $500+ level, so they, too, will require individual attention. Email list. People open almost 100% of their emails. Facebook and Twitter may be sexier, and they’re helpful for awareness, but social media generally does not prompt action. People only see approximately 5% of what is in their feed – and they are typically just scrolling through, commenting, and “liking.” Email prompts action. Most of our clients start out with their email address book scattered across multiple accounts, written on scraps of paper, in a stack of business cards stuffed in a desk drawer. For fast, effective group communication, this needs to be organized. It can take a while. Getting all email addresses correct, correctly labeled, and all in one account – or on a service like Mail Chimp – is a big undertaking. Start early. Social media. This comes into play closer to launch. Social media is blurb and image driven – and it’s called Facebook for a reason. People respond to faces! So in the months leading up to your campaign, get plenty of pictures of your smiling face doing your project, and craft catchy captions. T/W/Th before breakfast/during lunch/before bed are peak times. It’s easy to burn out your audience on social media, so plan out 2-3 posts per week. We’ll be doing a separate post dedicated to social media. Realistically, how much time does this take? If you have twelve weeks between now and launch, you have 30 VIPs, and they each get three hours of your time, one for each 1-2-3 meeting, that’s 30 x 3 / 12= 7.5 hours per week. Add to that, time to work with your designer, time to work on your elevator pitch, and time to draft mass email and social media materials, and you’re realistically looking at a 10-hour per week commitment for the three months leading up to your campaign. Sound like a part-time job? It is! That’s how you make money. A note on how effective communication feels while it is happening: Most of our clients feel message fatigue several times leading up to, and during, their campaigns. 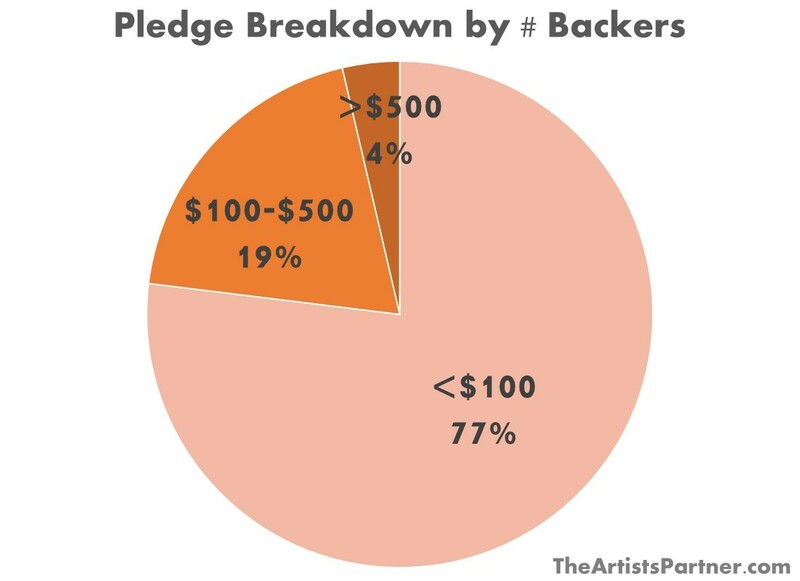 Many of them express that this is the hardest part of the crowdfunding process. They feel self-conscious promoting their own work. They feel like they’re shouting into the wind, saying the same thing over and over again, and meanwhile, nothing is happening. It is very hard to trust the cumulative effect of sharing your message 7 times. It is very hard not to take it personally when it feels like no one is listening. It is very easy to give up. When our clients are burnt out, we encourage them to take a day off, go do something fun, and forget about their project for a day or a week–to regain the perspective that life is, of course, about far more than a crowdfunding campaign. The artist can then come back to their tasks with renewed energy, with more focused attention to the process and not the outcome, and the ability to keep up the good work.